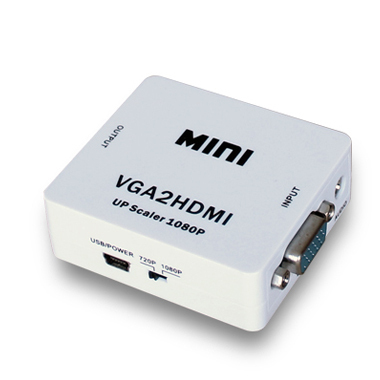 The Mini VGA to HDMI Video Scaler is designed to scale an analog PC VGA signal to a digital HDMI output with 720p or 1080p resolution. In addition to video scaling, the unit can convert an analog stereo audio to digital and embed it into the HDMI output. This unit provides advanced signal processing with great precision, colors, resolutions, and details.